Somewhere in the beginning of this year I made a silent resolution to post more savories than desserts as my collection of desserts in my content repertoire had shamefully grown than any other category. Time and again I kept reminding myself about readers being aghast about the paramount number of desserts I had on my blog, as if I had convinced them to believe that this is all we had daily. I had many mailing for basic recipes, as basic as making butter and ghee at home, more savouries for breakfast and tea time snacks, etc., while I had desserts brimming to my blog, something which was unintentional, but in course just unpremeditated. One of my colleague recently insisted I post recipe on basics of homemade curd, ghee and paneer when it came as a surprise to her on learning that we could make them all at home. From the time I can remember, I grew up seeing my mom skim off the cream from milk and freezing them for days to churn them into a good batch of butter or make ghee, ferment liters of milk overnight to make curd every single day without fail and weigh down blocks of paneer on those odd days when the milk separated temperamentally. I never considered them to be recipes in the first place, forget the thought of even considering worth posting, since it came to me quite inherently by instincts and not something I ever learnt to make. I mean, did someone give you lessons on how to boil milk? It was as synonymous to that. I don’t think I can come to a phase soon where I can post such basics here. Instead I would love to bring some of my favorite dishes on this table, those much appreciated recipes that are hearty and simple, and are regular in my kitchen. One such being this Lasooni Dal aka Garlic Dal that’s been my long time favorite. I keep it simple because it reminds me of my collage days when I lived single in a rented accommodation and cooked basic meals with simple ingredients and modest flavors for my sustenance. I managed to pull it through quite easily. A simple garlic dal, a quick stir fry of veggies made an utmost delicious Sunday meal along with the humble rice. 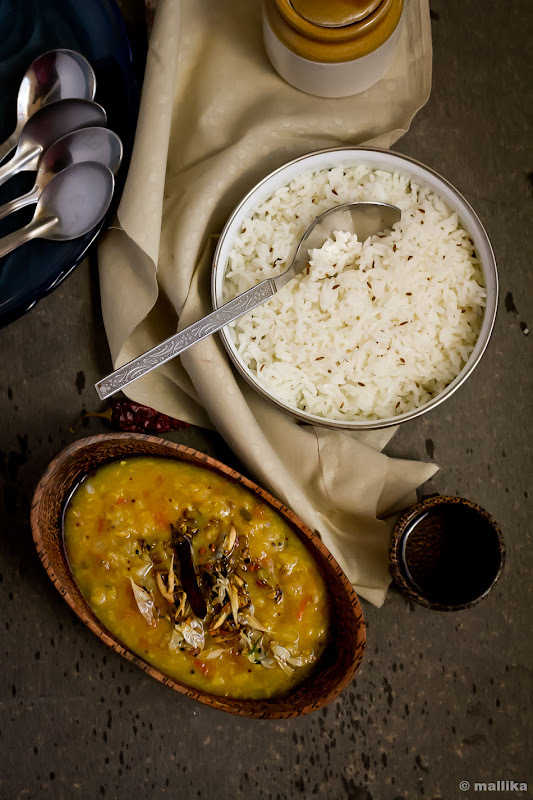 An east Indian twist to the dal here is with the tadka or tempering of Bengali spices. Paanch phoran is a blend of five (paanch) spices that is a unique Bengali spice mix made by mixing equal quantities of mustard seeds, cumin seeds, fennel seeds, nigella seeds and fenugreek seeds and storing it in an air tight container. I generally keep a ready mix of these spices in a container for my use on demand. 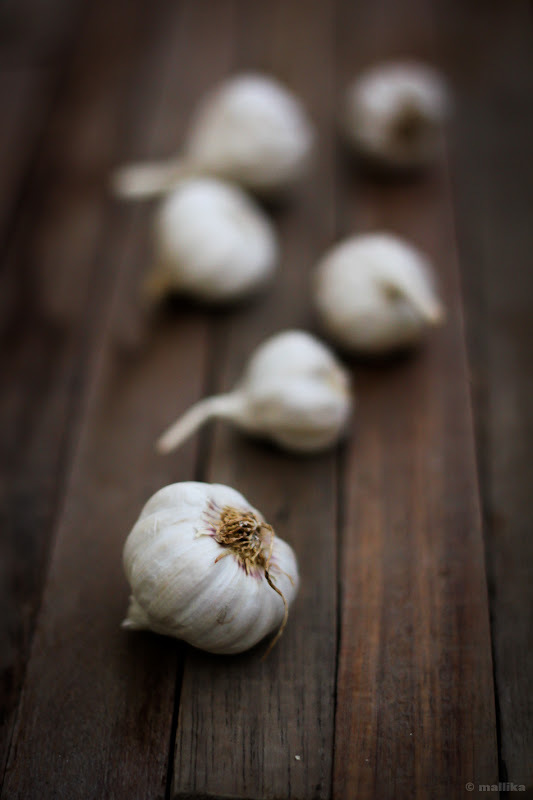 Its used to season many dishes and lends a lovely aroma to a dish when tempered. Do hope you love it too. Wash one cup of masoor dal along with the channa dal with couple of changes of water. Pressure cook the washed dal along with turmeric powder, chopped tomatoes and 2 ½ cups of water. Cook on 3-4 whistles till the dal is mushy and soft. Transfer the cooked dal to a wide mouthed utensil and add sufficient water to bring it to a soupy consistency. The consistency depends on how thick or thin you prefer. Keep it thick if you want to pair it with rotis and breads, and thinner if served with rice. Add salt to taste and bring the dal to a rolling boil. Turn off the flame and prepare the tempering. To temper, heat a wok with a spoonful of oil. As the oil heats up, add the crushed garlic and fry for a couple of seconds. As they turn translucent and fragrant, add in the paanch phoran mix and allow it to splutter briefly. Quickly add in the whole red chillies and fry for seconds. Turn off the flame and add in the red chilli powder, followed by asafoetida to the tempering. Add this to prepare dal and cover. Serve hot with rice or rotis. * I’ve used masoor dal with channa dal here. Channa dal gives texture while masoor dal gives volume to this dish. 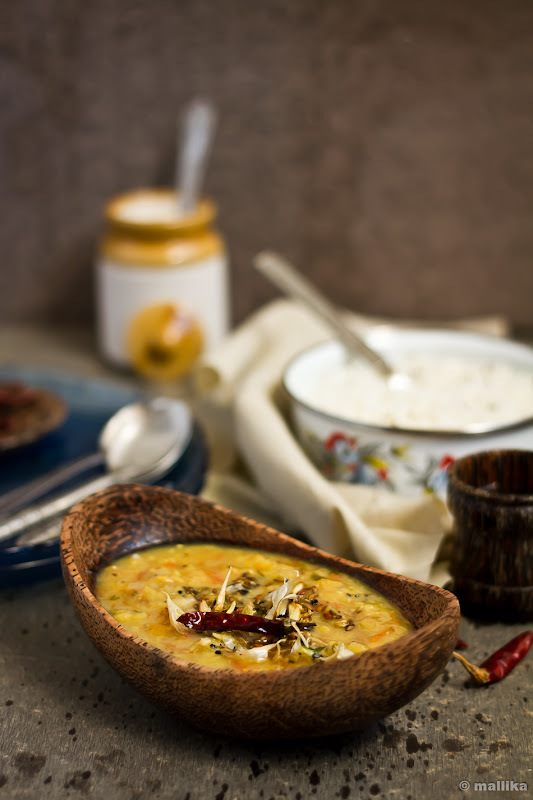 * You may use the same recipe with tuvar dal or moong dal instead. * Skip the red chilli powder to reduce the heat. * Asafoetida / hing aids in digestion and has a unique heady flavor, hence highly recommended. Wow. Yummy!!! I'm looking at the pics just after a ride and these are very enticing :-). Sweet and simple the blog is very well written and presentation is described in the first two words in my comment:D.
wow yummy delicious dal love it with chapathi. Hi...am a new visitor here and totally in awe with your recipes, the awesome pics and the fantastic write ups. Thanks Radha, appreciation is an art and you've got a flair in it. I feel so honoured when bloggers like you come over and comment positively to enliven my motivation. Thanks again for those kind words! Now that's flavorful. 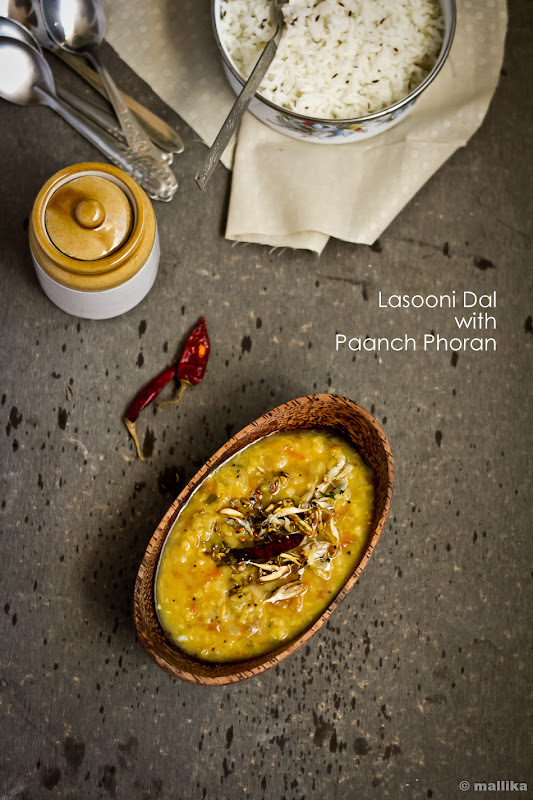 The panch phoron itself enhances the daal a lot and then you added my fav garlic too in it! That's comforting for any day. Your pictures stole my heart, dhal is lassoni is my fav specially the teasing flavours! simple food is always for soul, looking fwd to see more of basic recipes.